Rosewood Buttons: Do you shake? 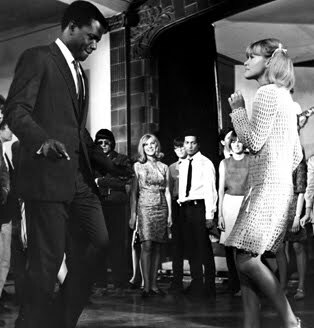 The impeccable Sidney Poitier gets his groove on with Judy Geeson. Last night, my dear friend Jameson and I were on our way to dinner, discussing Rosewood Buttons. I told her that I was going to soon focus on another favorite movie of mine, 1967's To Sir, With Love, with the subject line "Do you shake?" With that, we exploded into our best 60s shimmy and a fit of giggles, with neighboring cars questioningly staring at us. A few hours later, as we frosted birthday cupcakes, the students on Fox's Glee began to serenade their teacher with none other than the song To Sir, With Love. No, really, what are the chances? Glee proved to do justice to Lulu's smash hit from the film and made me all the more excited to write this post. I love Sidney Poitier as Mark Thackeray, engineer-turned-teacher in London's mean streets. Yes, these rough and tough students certainly rebel with their rock n' roll and hallway dancing. When student Pamela asks Thackeray if he shakes, a move meant to be intimidating, I just about die from, well, glee. 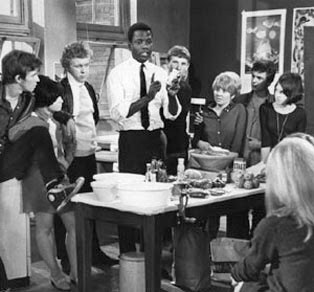 The blueprint to novice-teacher-enters-rough-school film, To Sir, With Love effectively, yet subtly, overcomes social and racial prejudices from the sixties - and today. It absolutely glows with heart and elegance. If there were more adults like Poitier's Thackeray, teaching youth respect for both themselves and each other, we would live in a vastly better world. Poitier teaching truths to his students. Mark Thackeray: It seems that you know so little and are so easily amused that I can look forward to a very happy time. Barbara "Babs" Peg: Who does he think he is there? Cheeky devil. Barbara "Babs" Peg: You ever been broke, Sir? Real broke? Skin? Mark Thackeray: Yup. Many, many, many times. Florian: Oh, I don't understand you a bit, Sir. I mean, you're a toff, and you ain't. Barbara "Babs" Peg: Well, Sir, you're like us, but you ain't, I mean, you're not. It's kinda scary, but nice. You know what I mean, don't you? Barbara "Babs" Peg: Oooh, look at me! I am a lady, I am! Barbara "Babs" Peg: If you want to dance wif me, you bleedin' well ask proper! Mark Thackeray: I think marriage is no way of life for the weak, the selfish, or insecure. Mrs. Joseph: So long as we learn, it doesn’t matter who teaches us, does it? Mark Thackeray: It is your duty to change the world, if you can. Not by violence, peacefully, individually, not as a mob. Mark Thackeray: Every new fashion is a form of rebellion.